Guys, haven’t you heard? Oatmeal is really cool. It’s not just tasteless mush spoon-fed to babies anymore. The coolest part about oatmeal is you can make it your own. Heck, there’s a store in New York City completely devoted to creating awesome variations on oatmeal. The second coolest thing is how versatile oatmeal is. Want it sweet? No problem. Want it savory? That’s even a thing these days. Want it caffeinated? Well, that’s where I come in. As the second installment to my “caffeinated foods” series, I present to you: caffeinated oatmeal. Oh yeah. Just add as much espresso powder as you want, and there’s not need for you to exert the extra energy it takes to hold coffee in one hand and a spoon in the other. Add some peanut butter and banana slices, sprinkle with more espresso powder (why not!) and cinnamon, and you’ve got yourself pretty bow on top of your beautiful buzzed up oatmeal package. Voilá! In a small saucepan over medium-high heat, bring coconut milk and water to a boil. Add oats, peanut butter, espresso powder, maple syrup, and cinnamon. Cook for about 2-3 minutes or until the oats thicken, stirring occasionally. If the oats are not at your desired consistency, add more coconut milk. Once oats are done, remove to a bowl. 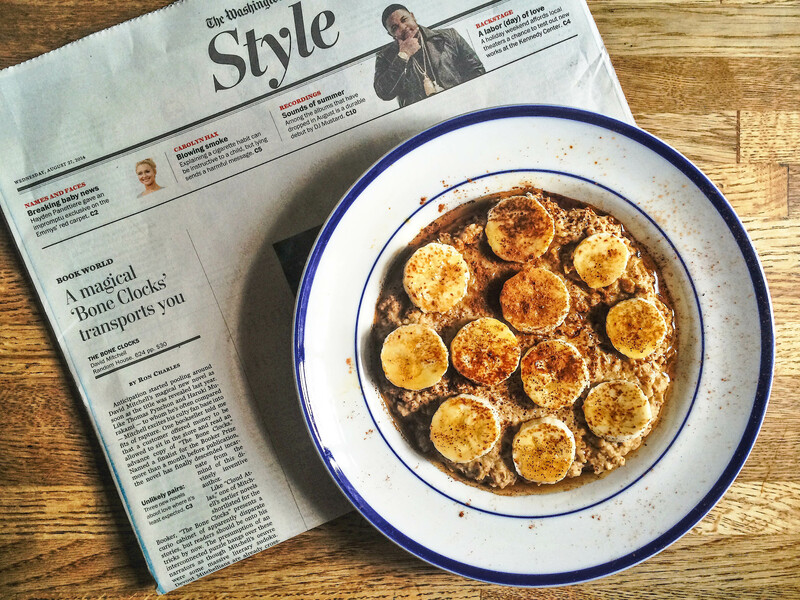 Slice banana and set atop oats. Sprinkle with cinnamon and espresso powder. Drizzle with more maple syrup. Banana and coffee are a fabulous combination! Thanks for reminding me I’ll be having these for breakfast soon! You made our morning chick-a-dee! Also yum. Great pic with circles in circle!